I like pasta and I like chips. Put both together and it's food heaven. 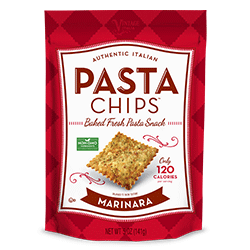 Pasta Chips is the very first company to recreate the traditional baked pasta from Italy into a snack food. Pasta Chips are made with the same semolina flour, ancient grains, and Italian herbs that were celebrated over 800 years ago. The Tuscan-inspired chip is married with different seasonings based on regional Italian favorites that are steeped in hundreds of years of Italian culture and living. Pasta Chips have 4g of protein, are cholesterol-free, and contain 60% less fat than potato chips and 20% less fat than pita chips. 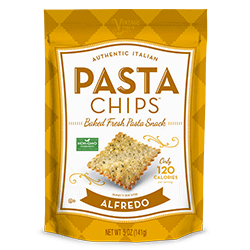 Pasta Chips were selected as one of the top 5 trends at the 2014 Winter Fancy Food Show. Even with all those advantages, what matters most to me is taste. After trying all five flavors of Pasta Chips, I'm won over by their taste. The flavors aren't what you'd normally find in a regular potato chip. For each chip, you can tell the taste of what the bag indicates. For instance, the Alfredo Pasta Chips are very similar to what an alfredo sauce tastes like. There's lots of taste in each bite. The pasta chips themselves are little squares with a light basked composition. Although they can be paired with dips, I like to eat them as they are out of the bag. The packages are resealable to lock in freshness. Alfredo - Has a creamy, buttery flavor of alfredo sauce. They were the most liked by my teens and the ones that were consumed the quickest. Garlic Olive Oil - Garlic and olive oil are paired together in this pasta chip. I'm a huge fan of garlic and these were my personal fave. Spicy Tomato Herb - This chip has a classic marinara flavor with just a bit of spicy kick and added herbs. Marinara - This chip tastes like a marinara sauce. Sea Salt - Although I liked this chip quite well, it wasn't as flavorful as the other four. It's a simple pasta chip seasoned with sea salt. This is the one I'd most recommend pairing with a dip. When you visit the Pasta Chips website use the code LOVE2BLOG at check out and you will receive 20% off discount. I've been curious about these pasta chips, I think I will give them a try now that I have read your favorable review. Thanks!